There are two types of residential painters. The one kind of residential painter knows little else than to just do straight painter type work, who won’t be able to perform any Painting and restoration services. He will be good at getting the room ready for working on it which would include covering the floors taking all furniture and essentials off the walls and out of the room. He will then go ahead inspect the walls and cover any cracks or holes with plaster or wall putty. He will ensure that there is no holes in your trim work such as are door frames or window frames. He will next sand the walls to make sure that they are smooth and free of rough surfaces and then he is ready to paint. Then there is the other painter which can do more experienced in House Painting Services, complicated complex work of this kind. This house painter is a more experienced painter handyman that is capable of replacing broken or bent wood. He is also trained in being able to strip down a wood door to its bare surface ready for priming or staining depending on what the homeowner wants to do with it. Sometimes very nice wood such as oak or walnut or mahogany is painted over with regular door painting, hiding the beauty of the wood. On a lot of older homes, with those old plain slab mahogany doors, this was done where the homeowner got sick of the stained wood look and painted over with white wood paint to update it to a more modern look. But nowadays things are going backwards and people like to see stained wood. Stripping the stain off what is a tedious process requiring skill and patience. The know-how on which paint strippers to use and for how long the stripper should stay on the wood before attempting to remove the first coat of varnish or urethane. This is a multi-process of recoating with paint stripper. After the oak wood has been stripped bare then it is necessary to do some sanding and wood repairs to bring the wood back to original condition. Ready for staining with your chosen stain color or for refinishing with a clear urethane coating. The trick here is to put multiple coats of clear on to give the sense of depth to the top finish. The more coats to put on the deeper and fuller the wood trim will look. 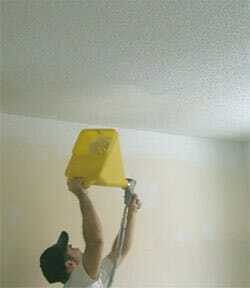 House painting services start with Plastering up small imperfections i the ceiling before paint finishing. In cases where the drywall is not fitting well and has taping marks still on it or has irregularities in the surface a, a professional painter will be able to re-coat with a skim coat of plaster to smooth out the drywall to give the fresh drywall a more even smooth finish. Sometimes the corners of the drywall are chipped and the painter can rebuild that corner to make it look good. Some house painters specialize also in stucco ceiling spraying and repairs. There is a certain amount of experience required to be able to match existing stucco ceilings. To restore a stucco ceiling there are some considerations such as: was the ceiling painted before? Are there any damages that have to be repaired such as loosened drywall taping from water damage? Are there any water stains on the ceiling that have to be sealed first? When the job action is established as to what to do in preparation for the ceiling a complete covering of all the walls and floors have to be done first to prevent any damages. If the ceiling only has some orangey brown stains from light water damage it can be sprayed with a special sealer that will prevent the stain from bleeding through the paint. After this sealer has dried a coat of white ceiling paint can be applied. If the ceiling has never been painted before though it will have to be painted with a special ceiling paint that does not dissolve the stucco in most cases this will be an oil-based paint. If the ceiling is damaged to the point where it needs to be drywall repair at first the affected area has to be removed and then a fresh piece of drywall inserted into that place and then re-drywall tape and plaster to a smooth finish. A light coat of stock will have to be applied over the bare drywall and let it set firm for a second coat overlapping the new section and old section of stucco to give the ceiling a continuous uniform look. Kitchen cupboard work is another main service we do. One of our customers ask us to refinish their kitchen cupboards. Kitchen cupboard doors can either be solid wood or a melamine finish/plastic. The first thing to do with these kitchen cupboards is to degrease them to remove any cooking oils and stains. Then with some light sandpaper sand everything down removing the gloss finish. This is a good time to replace hinges and knobs to make the cabinets look different and new and fresh.